-Safety Town is located at the Lewis Recreation Center at the entrance to Country Park. For GPS purposes, it is 3110 Forest Lawn Drive, Greensboro, North Carolina. -Safety Town is a 2 week program (2 hours per day) offered each summer that teaches young children about many safety issues. What are the ages of the kids that are eligible? -Safety Town is open to students that are 5 or 6 years of age. If your child is 5 or 6 years old at any time during the session they want to attend, they can attend. You do not have to reside in Guilford County to be eligible. What are the opportunities for middle and high school students to volunteer at Safety Town? -Our student volunteers are an invaluable resource for Safety Town. Without the assistance of these young people we would not be able to operate Safety Town. The general requirements for a volunteer is 12 years old or older and of good character. We are looking for young people that are truly interested in making a difference in our community. You may apply for as many sessions as you would like to work, but we ask that if you apply for a session that you can commit to the entire two weeks. Applications are will be available online starting on April 1 of each year. Paper applications are the only way to apply and instructions are available online. Can my child attend all 5 sessions? -No. Your child can attend only 1 session per summer. Safety Town is an extremely popular program and each year all sessions fill to capacity, so in order provide each child with an opportunity we must limit attendance to 1 session per summer. If your child is 5 years old - they can attend next summer if they are 6 years old during the time of the session. Can my child attend as a 5 year old and the again as a 6 year old? -Absolutely! In fact we encourage you to enroll your child at both 5 and 6 years old. We have found that it is beneficial to the child to come both years, just not two times during the same summer. Where is Safety Town located? -Safety Town is located a Lewis Recreation Center. Lewis Recreation Center is located at 3110 Forest Lawn Drive in Greensboro, NC. Lewis Recreation is adjacent to Country Park. Where can we apply and when are applications available? -Ambassador Registration starts February 1 starts April 1. Applications are made through our online portal. If you are an Ambassador (register early), you can change sessions if you need to prior to your session starting. Being an Ambassador is an excellent way to donate to Safety Town. All sales and registrations are final. No exchanges or changes unless you are an ambassador. Sessions fill up quickly. Can I increase my chances of getting my child in a preferred session? -This is a great question. I have several suggestions. The first suggestion is to get your application in ASAP. Spots are filled on a first come, first serve basis. Last year, morning sessions were filled within 2 weeks of the application release date. This year we are offering parents an opportunity to get access to applications before they are publically available by becoming a Safety Town Ambassador member. Ambassdor registration opens sixty days earlier than the general registration. Ambassador registration begins February 1 and General Registration begins April 1. -Parents are required to stay only the first day of the session). We will be providing parents with important information about Safety Town during that day. I know people who would like to donate to Safety Town, who should I talk to about this? How can I get in touch with Safety Town Staff? -There really isn't a staff for Safety Town as everyone volunteers. If you want to get in touch with Corporal Sherry Bruscino with the Greensboro Police Department regarding the program operations, you can e-mail her at sherry@safetytowngreensboro.com. If you want to get in touch with Maggie Sellers, who is in charge of volunteers (and a really cool college student) - you can e-mail her at maggie@safetytowngreensboro.com. 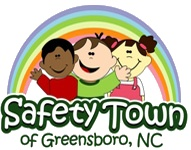 If you want to get in touch with Neal Leeper, who is President of Safety Town, Inc., you can e-mail him at neal@safetytowngreensboro.com or call him at 336-485-4545. Keep in mind that calls and/or e-mails regarding special grouping requests or other issues covered on the website are generally not answered.